As always said, relying on a single web hosting review site is not a good call to find and select a good web host. Some of the review sites are manipulated and paid to write positive reviews. So its better to have a check on a few different review sites before coming to a final conclusion. Earlier I had shared about a few like Web Hosting Geeks, Web Hosting Bluebook, Web Hosting Search, Web hosting rating etc., also tips on how to select the best web host and now here is one more similar site that would help you with the same, but more particularly for Joomla platform. Its JoomlaHostingReviews.com! Joomla hosting reviews is a site that reviews the various web hosting companies based on how well they are providing plans and service for hosting joomla websites and blogs. Narrowing the search for particular platforms, and not generally searching through everything, usually helps. Because, some trusted and well branded companies offer special packages for hosting certain types of websites, based on their platforms like WordPress, Joomla etc. The speed, pricing, and other features all change from the normal ones. One of the fascinating things about the site, is the review itself. Every aspect is covered well, and written with honesty displaying both the positive and negative factors, and finally the ratings given by the editor as well as the users who have rated it in their site. Info about the web hosting company, which indicates how old and big the company is, giving a sense on how much it can be trusted. The different packages, that suits the Joomla platform and in-general packages. The hosting environment, which says what type of control panel you are going to get and how well you can manage things around. Joomla on the hosting site – Shows how well Joomla would work on the hosting servers for that particular company. And how easy/hard it is to install Joomla through their control panel. Conclusion on the company’s running, and final words. And the overall rating includes things like the speed, uptime, features in the control panel, the customer support etc. So you are going to read something that gives you an idea on the whole about the web host. This even includes the pros and cons about the company and its service. Not just that, there are a lot more things that you would see if you navigate the site well. You will find a list of the Best Joomla Hosts (Editor Top Picks), and this list includes those companies with whom the site people had a good experience and received a good service in the end. The review site itself pays for hosting its websites in all those hosts, and then reviews them, to make a perfect list of the best hosts. It doesn’t end with the reviews. There is an Expert Joomla Advice section, where there are many informative and good joomla hosting guides, best practices in and about joomla, guides on how to install joomla on various web hosts, and the extensions that can be used with Joomla. 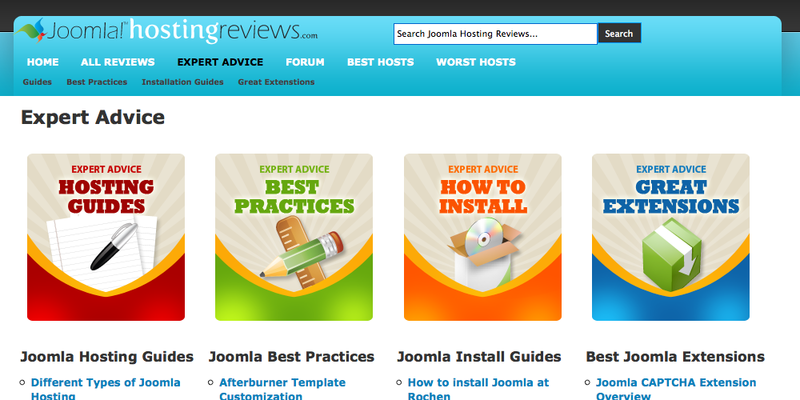 Joomla Hosting Review has created articles to assist with hosting joomla / installing Joomla / finding Great extensions. Check out the website to know how helpful it is, and how well you can take the advantage of it.